DIVE IN THE DARK The scenery changes!!! Experience the unknown underwater, encounter the mystery of the night and see the fish glow at the reflection of your light. The thought of dipping below the surface at night seems mysterious, yet so alluring. Although you’ve been scuba diving at a site many times before, at night you drop into a whole new world and watch it come to life under the glow of your dive light. The scene changes as day creatures retire and nocturnal organisms emerge. If you’ve wondered what happens underwater after the sun goes down, sign up for the Night Diver Specialty course. • Light handling and communication techniques. • Entering, exiting and navigating in the dark. • Identifying how plants and animals differ or change behavior at night. You may be able to get college credits for the Night Diver course – asks your instructor. Also, the first dive of this Specialty Diver Course may credit as an Adventure Dive toward your Advance Open Water certification – ask your instructor about earning credit. Visit Gold Coast Dive Centre to enroll in the course and get a Night Diver Crew-Pak that includes your manual and video. 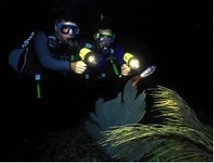 By studying with us you’ll be better prepared for the thrill of exploring the underwater world at night. 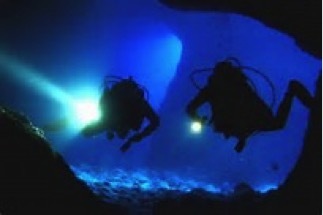 Along with your basic scuba equipment , you’ll need a primary dive torch and want to have a backup light, too. 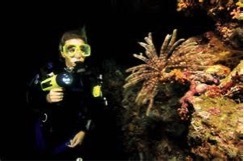 Your Instructor at Gold Coast Dive Centre may suggest other equipment options, such as wearing more exposure protection to stay comfortable after dark.